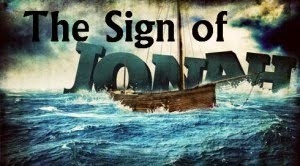 What was the sign of Jonah that Jesus spoke about in the Gospel of Matthew? We have learned in past articles about paying attention to repetition in Bible verses as these indicate emphasis. We especially learned to watch out for it when Jesus uses repetition. So I will be in the heart of the earth..."
"three days and three nights." As Jonah was "three days and three nights..."
so I will be "three days and three nights." So what was Jesus emphasizing? the three days and three nights. The three days and the three nights. The Hebrew original uses the phrase "from the belly of Sheol." The Jewish Encyclopedia tells us this about Sheol: "It connotes the place where those that had died were believed to be congregated." He sends some to Sheol..."
and He raises others up." the snares of death confronted me." So we can see from these examples that those who are in Sheol are dead. The same Sheol from where Jonah says he called unto the Lord. And rise again Jesus did, and on the very day He said He would. 39 "We ourselves are witnesses of everything He did in both the Judean country and in Jerusalem, yet they killed Him by hanging Him on a tree. How can "a mere Man" (v. 40) be appointed by God to be Judge of the living and the dead (v. 42)?